Perhaps the easiest way to make this happen is by factoring it into what a sponsor is expected to cover for an event and getting them to foot the bill. Some sponsors may be reluctant at first, so it’s going to be vital that you sell the idea to them. Offer to have their logo printed on all of the tickets/wristbands for your event as part of the deal. This works best with beer and liquor sponsors and other relevant advertisers who can incorporate their branding and logos into your design. The first thing you need to remember is that you are offering them a valuable opportunity from the get-go by letting them print their logos on your tickets/wristbands. Your event is going to gain a lot of exposure which will transfer to their brand, and they know that, which is most likely why they sponsored you. So, why wouldn’t they want to help you cover the cost of something that could be so beneficial to them? Keep this in the back of your mind and be confident when pitching the idea to them. Remind your sponsors that by having their brand/logo printed on your tickets or wristbands, they’ll be the first thing customers see at your event. Their brand will literally be attached to the customer, constantly reminding them about your sponsor even if they don’t realize it. Down the road, that sort of brand recognition could easily turn into sponsors gaining new business because of the exposure they got at your event. When the time comes to design the tickets, keep them involved with the process so they feel comfortable with what they’re paying for and how their brand will be represented. Any great ticket/wristband printing company will let you see proofs of the product you’re ordering before they ship out, and you can share those proofs with the sponsors so they know exactly what they can expect when the shipment comes in. By mentioning the idea early, being confident, selling it to your sponsors and letting them know how it will benefit them, and keeping them involved in the process, you can easily get your event tickets/wristbands covered. Once they’re on board, your next step is to take your plan and put it into action. Tickets are considered by many to be the best low-cost option for any type of nightlife event. Many ticket printers (including us) offer the option to fully customize tickets with any graphics, logos, or info you and your sponsors may want on there. Make sure you go with a company that offers proofing early in the process; sponsors will feel more at ease with paying for a product when they have seen it first. Once they see their logo front and center on the ticket, any doubts they had will probably vanish. Make sure to adapt your ticket design depending on the sponsor you have. For example, if your event is sponsored by a beer company and you’ll only be serving a limited selection of beers, why not list the options on the drink tickets so that when customers are finally face to face with the bartender they already know what they want? 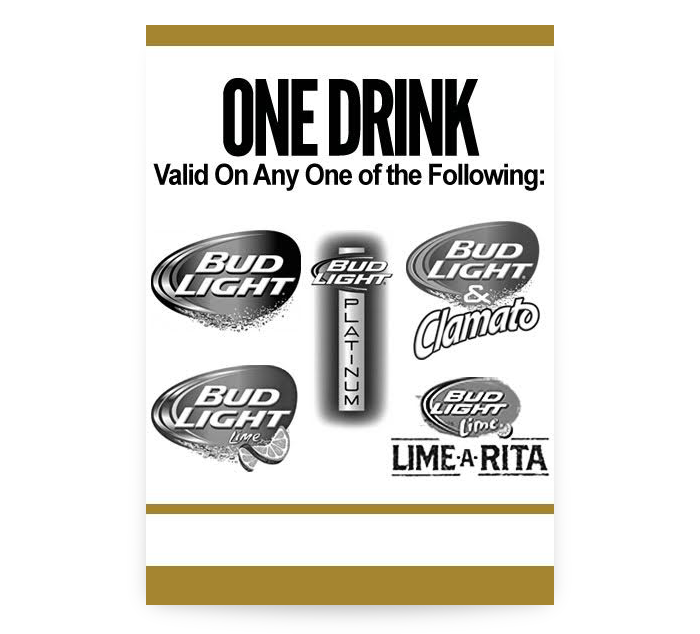 You’ll be saving your guests a bunch of time at the bar, and you’ll also be doing your sponsor a favor by marketing a bunch of their brands (make sure you mention that to them when you’re asking them to cover your printing bill). 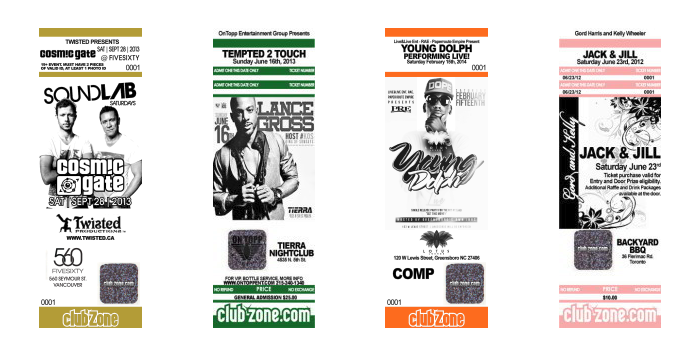 However, there are some limitations to using custom printed tickets for your event. Although most companies can print almost any graphic or logo on a ticket, color options can be extremely limited which may make some larger brands who depend on specific colors for brand recognition a little wary. That’s where wristbands come in handy. 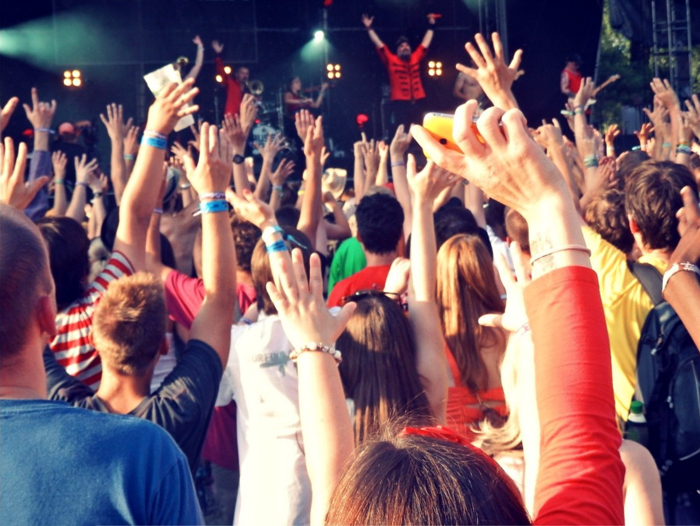 Wristbands have become almost a norm for a variety of outdoor or multi-day events such as festivals. There are many different types of wristbands you can choose from, including tyvek, plastic, and silicone, but if you’re looking for the most eye-catching, comfortable, and durable option, you simply can’t go past cloth wristbands. 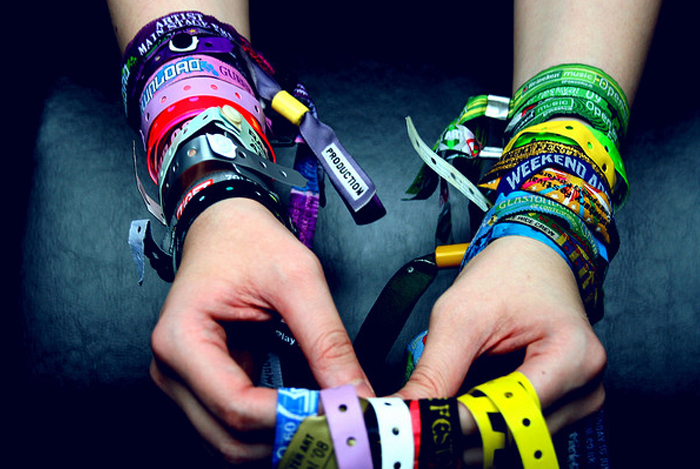 A lot of festival goers like to hang on to their wristbands, which results in added marketing for you and your sponsors. If you’re planning to customize cloth wristbands in order to tempt your sponsor into picking up the bill for you, you’ll be glad to know that your design options are limitless. This will come in handy particularly if your dealing with a big sponsor who may have a logo that uses complex color schemes; like we mentioned before, color options can be limited when you’re printing standard tickets. Here’s a good way to pitch the idea of printing customizable cloth wristbands to your sponsor and encouraging them to foot the bill: Start by telling them that due to the limitless design options, they can have their brand represented EXACTLY how they want. If your sponsor uses a particular signature shade as part of their logo, ticket providers will be able to use PMS color match technology to print the wristbands using that exact shade or color. Also let them know that the added durability of cloth wristbands exposes guests to their brand for longer. A lot of festival goers like to hang on to wristbands to remember the event they attended, which means they’ll also be hanging on to, and subconsciously looking at, the brands that helped that event come to life. Finally, the added security benefits of cloth wristbands is unmatched, as they cannot be easily removed or transferred and they are impossible to duplicate. Customers can wear them for days without any discomfort, and they can withstand any elements. 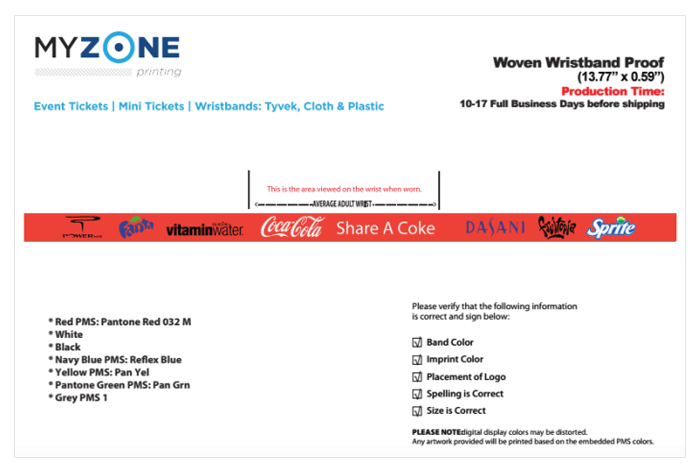 As far as drawbacks go, cloth wristbands almost always need to be prepaid before they are shipped out, but the sponsors should be able to check out a proof the same as they can for printed tickets. Furthermore, they can be a little pricey in smaller quantities, but if you’re planning a larger event then they can quickly become a very affordable option. Never Pay For Wristbands or Tickets Again! Next time you’re starting to plan for an event, make sure you think about tickets and wristbands early on so that you can include the cost into your sponsorship package and get them for free. Remember; getting your sponsor to cover printing costs for you is a win-win situation: They will benefit from all the exposure their brand will receive from printing their logos on your tickets or wristbands, and you can incorporate your own graphics, venues, or other info for brand exposure on both ends. Let the partnership between you and your sponsors extend into every detail, including wristband and ticket production, and you can save money on your event while making your sponsors happy and ensuring a lasting business relationship that will continue to benefit both parties. For more info on ticket/wristband printing, feel free to contact us.